Looking at modern Western cartoons like Steven Universe, Bee and Puppycat and The Legend of Korra, it’s obvious that a generation who grew up watching anime is behind them. Anime, or Japanese animation, only really became popular in the West in the 90’s, when kids got a chance to watch it on channels like Cartoon Network. Now these kids have become adults who create their own cartoons. The influence of anime is clear in elements like art style, content references and a larger focus on story arcs compared to cartoons of the past. A lot of modern cartoons are strongly influenced by a very specific genre of anime- the magical girl genre. A “magical girl” is a young woman who transforms to unlock magical powers, commonly paired with pretty baubles and an animal mascot. Often these girls use their powers to battle evil. The most well-known magical girl series in the West is the 90’s hit Sailor Moon, featuring sailor-suited girls and their talking cats fighting monsters in the name of love and justice. 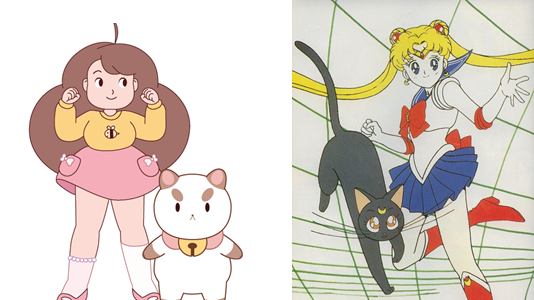 Lately, a ton of cartoons have been referencing Sailor Moon’s iconic transformation sequence. But that’s not where the influence ends. 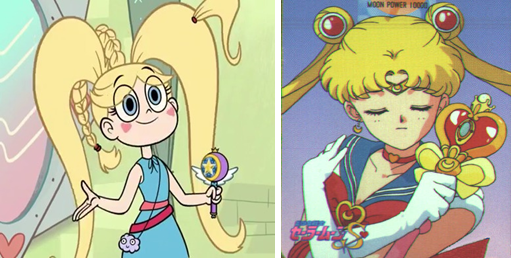 Many shows are taking a lot of overall inspiration from Sailor Moon and other magical girl stories. 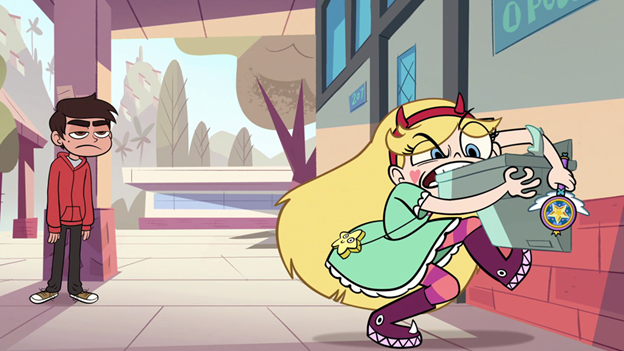 Star vs The Forces of Evil features a cheerful, energetic princess of another land finding her way to Earth and fighting interdimensional monsters with a colorful magical wand and shouted catchphrases. This is the general premise of most magical girl shows, including Sailor Moon. Bee and Puppycat focuses on a pink-loving slacker undergoing a magical transformation with the help of a talking cat-creature. Again, wholesale magical girl. Steven Universe features a team of warriors from space fighting to protect the earth, and is chock full of references and inspiration from Sailor Moon and other magical girls (magical weapons and a focus on crystals are just the tip of the iceberg), even going so far to include a cameo appearance of the Sailor Moon manga. A new cartoon coming up, Miraculous Ladybug, may be the ultimate example of a cross-cultural magical girl show. 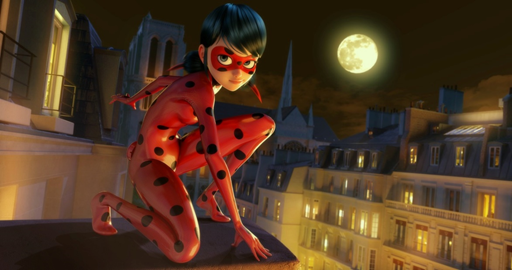 French studios are teaming up with Toei Animation, the studio behind Sailor Moon, to create a brand new show focusing on a girl who transforms into a hero and gains magic ladybug powers of luck. So what does all this magical girl influence on our animation mean? Well, in my opinion, only good things. After all, it’s giving us more cartoons focused on girl heroes. Back when magical girl shows first came to this side of the pond, it was noted by various scholars that cartoons about girl heroes weren’t really common over here and weren’t valued by American executives (they even tried to hide how “girl-focused” these shows were when marketing them). But those very shows helped this begin to change and girls are starting to get a chance to shine the magical girl influence is also allowing for more variety in our animated female heroes. 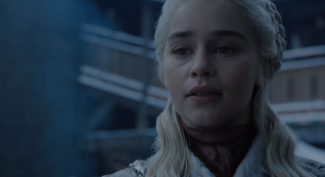 It’s notably a trend in American media for any female character to be portrayed as sensible, intelligent and restrained while the male hero she’s with is goofy, fun and not-too-bright. 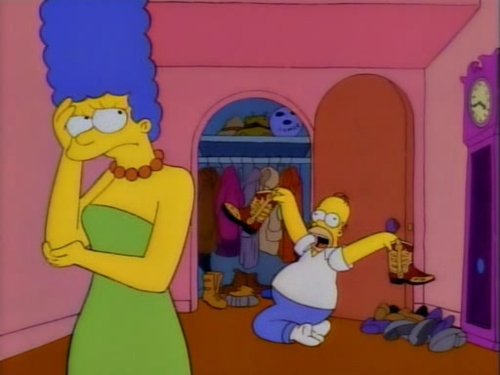 Think about the male Simpsons vs the female Simpsons, think about any romantic comedy ever. This may seem like a complement to women, and there are certainly many sensible girls out there, but it’s also very limiting. Guys get to be the fun ones, while girls are the wet blankets. As a result, girls are sent a message that they’re not supposed to goof around or make silly mistakes. However, whether due to cultural differences or an effort to make the hero relatable, this isn’t the case for most leading ladies in magical girl anime. 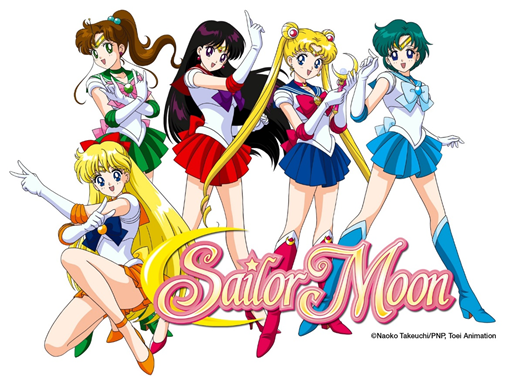 Sailor Moon is a wacky girl brimming with fun. Her boyfriend, Tuxedo Mask, is more sensible one. Most of the leads in other magical girl shows, from Precure to Princess Tutu, follow her in that. And by the same token, so do the cartoons we’ve talked about. Star is totally off-the-wall while the guy she hangs around with is more down-to-earth, Bee is a goofy slacker and Amethyst from Steven Universe recklessly lives it up. Girls are finally being told they can have fun. Another thing the magical girl hero brings to the table is a presentation of cuteness and femininity as powerful rather than weak. While female heroes are supposed to maintain their sexiness and feminine good looks, real passion for what are considered “girly” things (cuteness, dates, emotions) is presented as shallow and damaging. The more girly a character is, the less effective she is in the hero team. 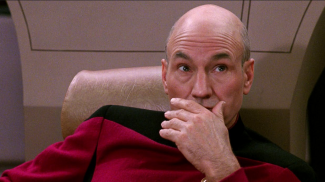 This is also why “cute” shows were traditionally looked down on. This is the reason I hated being perceived as feminine when I was younger and it’s something watching Sailor Moon helped me overcome. Magical girls are cutesy and feminine, but they wield it as power, which showed me there was nothing inherently “bad” in feminine traits. Back in the day, a lot of young girls said the reason they were drawn to Sailor Moon was because she was more like them than other heroes to and she didn’t have to act like “one of the boys” to succeed. Now, the issue is different in the context of Japanese culture (some articles by Akiko Sugawa-Shimada give an idea of the complexity in the discussion of magical girls and Japanese gender roles), but it’s certainly somewhat positive for girls who like that stuff over here to have stories where being “girly” can be powerful. What’s especially great is when those traits are shown to be positive and powerful in boys and that’s the cool thing about Steven Universe. 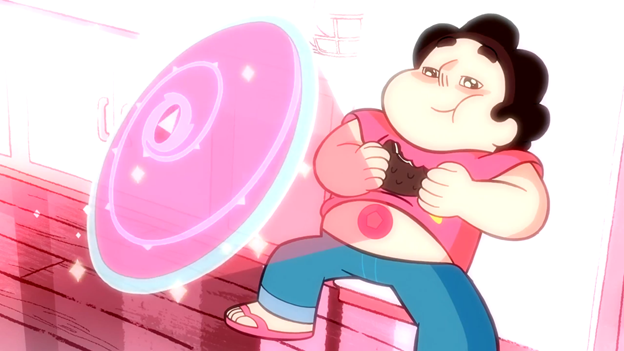 Steven has the personality of your average magical girl protagonist. He’s sensitive, he cries easily, he encourages understanding and harmony, he’s a hopeless romantic and his powers are based mostly in shielding and healing. Moreover, these traits of his save the day over and over again. By letting Steven embody the magical girl archetype, the show sends a message to boys that they don’t have to limit themselves to a rigid masculine ideal. It teaches boys that there’s no weakness in emotion and that they can be great without relying on violence or rejecting everything associated with women. This is a tremendously important message, as it helps dismantle toxic masculinity. Telling boys that they have the freedom to express themselves however they wish saves them from a lot of psychological pain. It also creates a freer, kinder society where women are more valued and boys don’t have to fear being “too weak”. Steven Universe also shows that putting a boy in a magical girl’s role doesn’t mean one has to sacrifice a focus on powerful women. Steven looks up to and learns from a variety of magical ladies, communicating to boys it’s cool to have female role models. The show celebrates girls, boys and everyone in-between. I’m excited to see what further impact magical girls will have on animation. I hope we continue to see shows that present a variety of female heroes and mess with tropes and gender roles. Bring on the magical girl revolution! Want to know more about magical girls? Check out “6 Essential Stories for Understanding the Modern Magical Girl Genre”!